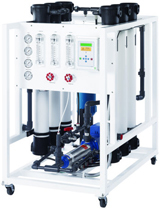 Complete logic controlled commercial/ industrial grade reverse osmosis. Equipped with high-end electrical controls such as NEMA 4 fiberglass enclosed electrical circuits, low pressure bypass delay, time delay start, and real time monitoring lights for power, low pressure, running, and tank full. 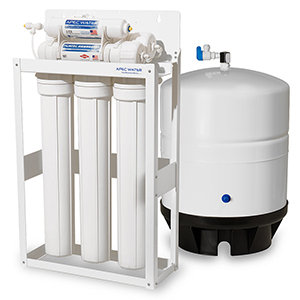 Our top of the line "Turn-Key" whole house water system, ideal for the homeowner with water supplies that demand advanced water treatment processing. System is constructed on steel frame with casters. Pre-wired and pre-plumbed for easy install. Includes: back-washing carbon filter, twin tank water softener, reverse osmosis, repressurization, ultra violet water sterilizer, water storage tank, and many other exclusive features.